We offer free shipping on orders over $100 within the contiguous 48 US states. Expedited shipping available for select items. Orders under $100 are charged a flat-rate shipping cost of $15. Please call customer service at 888-908-2925 for shipping rates on all orders going to Alaska, Hawaii, Puerto Rico and any US islands only accessible by ferry. For international shipping rates, please check out at our international site. If we are unable to provide you free shipping due to your location, you will be contacted by customer service to confirm your shipping rates before we process your order. Sophisticated styles brought to light. See your home reflect your style. Add a touch of joy to any room. Craft an exceptional home with these hand-knotted, one-of-a-kind beauties. Impress your guests with the perfect dining sets. Built to be functional. Designed to be fabulous. Find safe, stylish, and eco-friendly kids furniture and accessories in our expertly curated kids shop. Give them room to grow with these fresh finds, from the playful to the sophisticated. A vision in taupe! These elegant, distinctive designs retain a refined cohesion. Contemporary and masculine—an updated take on 1940s American living. Smart and organic, this handsome collection delivers contemporary comfort. A neo-traditional ensemble that pairs classic forms with contemporary finishes. Steeped in English tradition, these pieces offer sophistication with casual appeal. Contemporary French-influenced pieces with a glamorous, modern energy. White oak and argent hardware bring clean cut sophistication and style. Bright, clean, and sophisticated pairings for the well-tailored home. Feminine, classical, and understated—a fresh take on traditional luxury. Embody the spirit of the traveler with eclectic glamour and global influences. Rustic and modern, delivering clean lines and masculine sophistication. Thanks for sharing! Enter your e-mail address here, and we will send you the code for 10% OFF your next full-price purchase. Free Standard Shipping on Orders over $100 or More. Ships within 10 business days. Please allow up to 2 additional weeks transit time for your item to arrive. For Made to Order items, please view the product specifications for additional lead time information. Enter your name, email, and question below, and we'll get back to you before you can say "chinoiserie"
There are errors with the information you have entered below. We offer FREE Standard Shipping on all orders over $100 and more within the contiguous United States. On small items, this includes a no signature required, parcel delivery. dry area or garage with no stair carries or debris removal. Want an upgrade? You’ve got choices. 4 hour window, by appointment delivery. Stair carry for up to 1 flight of stairs. 2 person in-room placement and debris removal. 30 minute, non technical assembly. Does not include electrical component hookup. *Does not apply to international orders. 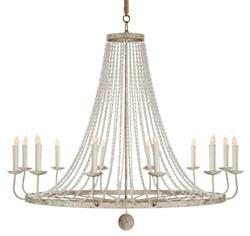 All eyes will be on this beautifully beaded twelve light chandelier. White, speckled wrought iron arms support a dozen candelabra lights as they dazzle from the ornate, oversized circumference of this elegant French country classic. Copyright © 2011-2019 Kathy Kuo Home All Rights Reserved. We offer international shipping on all items to countries across the globe—from Australia to Zimbabwe. Bring beautiful design to your very own corner of the world. Note: Once you place your order, a Kathy Kuo Home logistics expert will be in touch with your international shipping cost within 2 business days via email. International orders will not be considered final and will not be charged until you approve the international shipping costs.